Chilkoot Trail & White Pass & Yukon Route Railroad on one map! 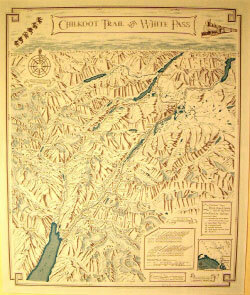 Drawn to scale (1:126,000), in an aerial view style for easy reading, this map contains the Chilkoot Trail, White Pass and Yukon Route Railroad, and the Klondike Highway from Skagway and Dyea to Lake Bennett. 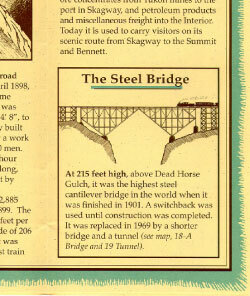 The backside is filled with historical information on the 1898 Klondike Gold Rush as well as the White Pass Railroad. Printed on 100% tree-free paper! Contains Gold Rush tent camps and current campgrounds on the Chilkoot Trail. Bridges, tunnels and major waterfalls along the White Pass and Yukon Route Railroad are also shown. 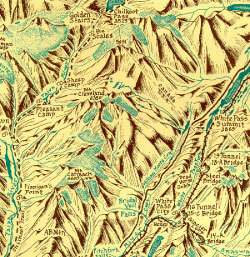 Historical information on the1898 Gold Rush and the White Pass and Yukon Route Railroad, with accompanying illustrations, presents itself as the map unfolds. Use this button for a Rolled map. To order, please use the "Add to Cart" buttons for each item.